So I have the option with the important info above. I am trying to generate a portfolio that represents the option. However I am stuck on the first hurdle as I believe it is a call option as the product makes a profit only if the underlying share price rises above 121.35 to 145.50 and it is capped at the 145.50 price. The maturity also seems confusing as I believe it to be the 28th November, starting on the 3rd, which is 211 working days which seems a bit random. Is the issue price of 115.78 the cost of the option? as this seems quite high. I think this means that if the share price falls or doesn't hit the capped level then at expiry it is worthless and will simply provide the share price at the time. Basically is what I have said correct? Thanks. From @noob2's link, it looks like the product behaves like a basket of a long position in the underlying and short an out-of-the-money call option; thus the discount vs the price of the underlying is the implicit value of the call. As with any option, if you sell one and it stays out of the money, you get to keep the premium, so if the price of the underlying doesn't end up above EUR 145.5 at worst it was a bargain price for the asset. 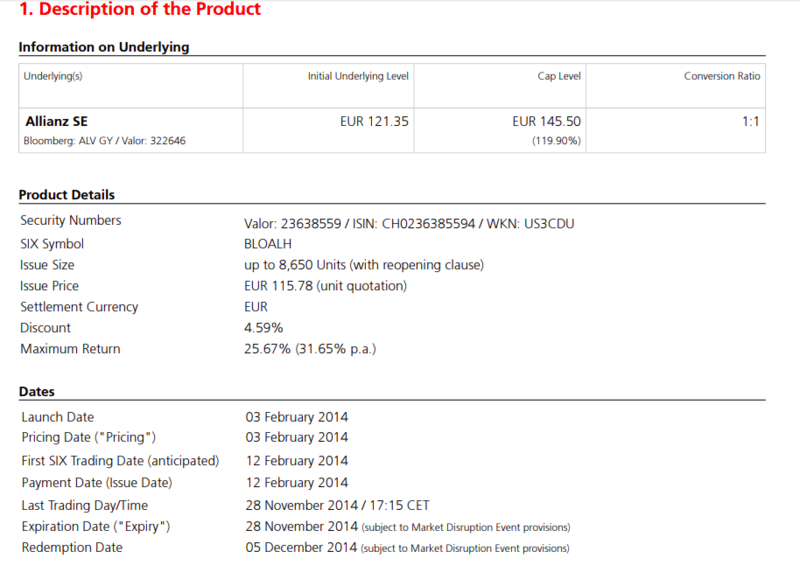 At a glance it looks like the price was around EUR 139 at the end of 2014, so that paid off. You could also include in your valuation that it appears that although the price is paid at the issue, the investor receives no collateral or interest, and is only paid at expiry. Thus it is also an unsecured loan of the cash for the 9 months or so; the issuer could enter a par forward contract now for delivery at the expiry, and have use of the cash now. Thus it is a good sale for a bank which needs to raise its capital reserves. Not the answer you're looking for? Browse other questions tagged options finance portfolio call payoff or ask your own question.